← Sure, I’ll vote for Trump! What have I got to lose? When debating any controversial issue, the first thing one has to do is sort the lies from the truth. On the pro-gun side, mistruths seem to be few and far between. "Death Wish(ful) thinking" fantasies like the vigilante granny who shoots rapists or the prepubescent shotgun champion who blows away a couple of home invaders simply aren’t documentable. Neither, as far as we can determine, is the attribution to George Washington that civilian-held guns are "liberty’s teeth." The falsehoods propounded by the anti-gun side seem to be much more numerous. For instance, the gun prohibitionists keep telling you that a gun in your home is more likely to kill you or a loved one than to protect you. This draws from the Kellermann study, which has been long since discredited so thoroughly that it is widely cited as a classic example of junk science and "lying with statistics." For one thing, only deaths were counted. Any criminologist who has impartially studied this issue will tell you that the vast majority of DGUs (Defensive Gun Usages) end with the criminal fleeing or surrendering as soon as the armed victim pulls a gun on him. These are conspicuously absent from Kellermann’s and similar studies. The citizen doesn’t want to kill and goes to great lengths to avoid it; the home invader, often motivated by murderous hatred or vindictiveness for those who live in the target dwelling, goes there prepared to commit murder and often intending to. Starkly, apples and oranges. We recently saw a Presidential candidate, Hillary Clinton, lambasting her Democrat rival Bernie Sanders with the argument that a large number of murders in anti-gun New York State were committed with guns bought in his adjacent state, Vermont. In fact, research shows that only a tiny portion of "gun crimes" in the Empire State were committed with firearms purchased in the Green Mountain State. Indeed, Vermont — with gun laws so relaxed that since the early 20th century, every law-abiding citizen there is allowed to carry a loaded concealed handgun in public without a permit — not only has a lower rate of violent crime than anti-gun New York State, but in many years has been among the lowest states in ratio of violent crime to population and has often been the lowest. Every time reform legislation has been enacted to allow ordinary law-abiding people to carry guns for self-defense, the prohibitionists have cried that blood would run in the streets … and every time, that has failed to happen. Rates of criminal homicide (as distinct from justifiable homicide in self-defense) have instead stayed at the previous rate, or actually dropped. See the best-selling book More Guns, Less Crime by Professor John Lott. Lott’s studies have enraged anti-gunners, who claim to debunk them. Sorry … disagreeing with the outcome does not equal debunking the outcome. Speaking of which: Even the prohibitionists who claim to have debunked Lott’s work claim there are "only" 55,000 successful defensive gun usages in America per year. While this is far below what Lott’s research indicates, it is still far above the 30,000 preventable gun deaths a year the anti-gunners continually quote. Remember that approximately two-thirds of those are suicides which, tragic as they may be, usually do not endanger anyone but the individual determined to end his own life. Remember also that the "30,000 annual gun deaths in America" include violent criminals killed by police in the line of duty, and violent criminals killed by their intended victims in lawful, justified self-defense. Gun culture or gangsta culture? Bear in mind that The Guardian is by no means a pro-gun-rights entity. They are to be commended, however, for taking an even-handed, research-based approach to the cited article. 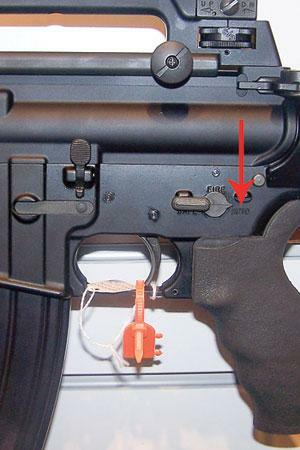 Arrow shows visually tiny but operationally huge difference between one-shot-at-a-time AR15, and this M16/M4 set on full “AUTO,” i.e., machine-gun mode. AR15s look the same but don’t work the same. 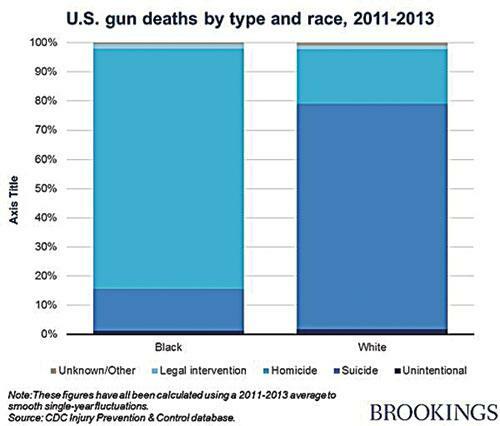 According to the Brookings Institute, "Gun deaths also vary dramatically by type. The vast majority (77 percent) of white gun deaths are suicides; less than one in five (19 percent) is a homicide. These figures are nearly opposite in the black population, where only 14 percent of gun deaths are suicides but 82 percent are homicides. White racists twist those figures to imply that black people are inherently violent, and on the other end of the spectrum, it has become politically incorrect to discuss the race/murder rate correlation for fear of being associated with racism. This ill serves the mostly African-American victims, and the many innocents killed or wounded in what the statistics coldly call "corollary damage," those hit by stray shots in drive-by shootings and gang activity-related shootouts. It does not matter to the innocent dead nor their grieving survivors whether the illegal guns that discharged the death bullets were held in the white hands of outlaw bikers in a gang war or the brown hands of drug dealers fighting over turf and "street cred." It isn’t racial so much as it’s cultural, and specifically, sub-cultural. The enslavement of blacks in America dates back to the year 1619, when the first slaves were brought from Africa to work on Virginia plantations. The Emancipation Proclamation did not come officially until 1863, and could not truly even begin to take effect — however weakly and haltingly — until the slave-holding states were defeated in 1865 at the end of the Civil War. The institution of slavery had lasted nearly two and a half centuries in this country, 246 years to be exact. But the end of the Civil War obviously did not automatically bring equality. Segregation in the American South was not officially ended by law until the Civil Rights Act of 1964, a year short of an additional century. And, as almost any African-American can tell you today, the turning points of 1865 and 1964 did not erase bigotry, nor a legacy of denial of education and opportunity that has, by now, endured for just under four centuries. These disadvantages breed poverty. Poverty breeds crime. Any honest sociologist or psychologist will tell you the same. Crime, naturally enough, breeds criminal subcultures. Whatever the race, whatever the countries, gangs are formed. Call them warlords, call them cartels, call them whatever the local term may be, they tend to slaughter people of their own communities (villages in microcosm, nations in macrocosm) who disagree with them. Depending on availability of weapons, they may use machetes and clubs (Africa), Zyklon B (Nazi Germany), poison gas or other weapons of mass destruction (Iraq under Saddam Hussein) … or guns. The tools don’t matter. The deadly animus lies at the core of murder in the individual or genocide en masse, and to blame the death weapon instead of the murderers is as futile — and, yes, as stupid — as treating cancer with Band-Aids. "There are data not only from our 50 states but also from other countries around the world. Professor Joyce Lee Malcolm’s empirical study, ‘Guns and Violence: The English Experience,’ should be eye-opening for all those who want their eyes opened, however small that number of people might be. Professor Malcolm’s book also illustrates the difference between isolated, cherry-picked facts and relevant empirical evidence. Many gun control advocates have cited the much higher murder rates in the United States than in England as due to tighter gun control laws in England. But Professor Malcolm’s study points out that the murder rate in New York has been some multiple of the murder rate in London for two centuries — and, during most of that time, neither city had serious restrictions on gun ownership. As late as 1954, ‘there were no controls on shotguns’ in England, Professor Malcolm reported, but only 12 cases of armed robbery in London. Of these only 4 had real guns. But in the remainder of the 20th century, gun control laws became ever more severe — and armed robberies in London soared to 1,400 by 1974. ‘As the numbers of legal firearms have dwindled, the numbers of armed crimes have risen’ is her summary of that history in England. Conversely, in the United States the number of handguns in American homes more than doubled between 1973 and 1992, while the murder rate went down." 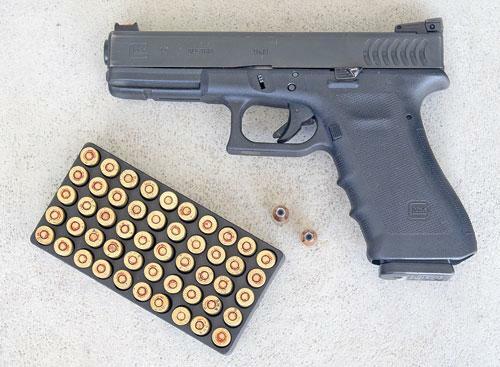 Typical Glock 17 police pistol holds 18 9mm cartridges and is issued with two more 17-round magazines, for a total of 52 rounds on officer’s person. Why should armed citizen face the same criminals as cops, with less firepower? In 1994, then-President Bill Clinton was able to pass a crime bill which, for a decade, banned the sale of new ammunition magazines holding more than 10 cartridges. A majority of statisticians and criminologists alike have since determined that, during the 10 years before the law sunsetted, it had no significant impact in reducing crime or homicide. Several states passed similar legislation before, during, and since, however, limiting their magazine capacity to ten (or, in a few cases, fifteen) shots. These, too, have had no significant effect on crime rates or homicide rates. On the other end of the spectrum, does the limitation on cartridge capacity impair the private citizen’s ability to protect self and loved ones against violent armed criminals? Consider the following. American police have been routinely armed on duty (and even been required, or at least encouraged, to be armed off-duty as well) since before the 19th century turned into the 20th. Throughout that period, the standard "load-out" for an on-duty police officer was a fully-loaded handgun plus two full reloads of ammunition. For much of the 20th century, that meant six cartridges in the service revolver and 12 more in belt loops, cartridge pouches, or cylindrical speed-loaders. By 1990, most of America’s police had switched to semiautomatic pistols, and were carrying 52 9mm cartridges on their person (17 in the full magazine of the Glock 17, one more round in the firing chamber, and two spare magazines in the belt pouches) or Glock 22 pistols with three 15-round magazines of .40 S&W ammo and the cartridge in the chamber for 46 shots on tap. Your local police are the resident experts on the criminals in your community. The police are usually called to respond after one of those criminals has attacked one or more innocent victims. If they have determined that a handgun with full magazine capacity and two spares is the best equipment for them to use to protect you and your family from those criminals, it would seem to make sense that this is also the best equipment for you to use to protect yourself and your family from the exact same criminals. There is also the matter of the physically challenged. It’s hard enough for a person in a wheelchair — the quintessential potential victim — to be able to carry a gun. It’s harder still for them to find a place on their person or in the chair to store spare ammo. The one-armed person or the acute arthritis sufferer will be slow indeed to reload if necessary … much slower than, say, an able-bodied mass murderer. Thus, magazine capacity limits have an obvious disparate impact on the less-than-able-bodied person who needs to use a firearm in self-defense. And, if stabbed or shot by the criminal attacker early in the fight, that less-than-able-bodied victim fighting back in desperate life-or-death self-defense could be any of us. 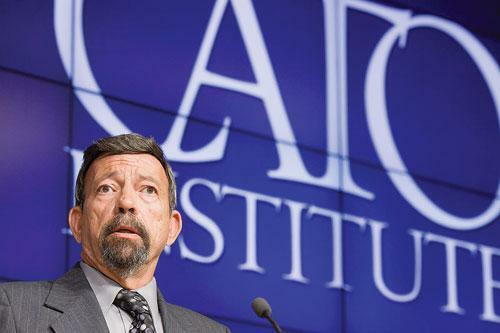 Author explains “Stand Your Ground” principles at CATO Institute, 2012. The anti-gun activists seem to universally denounce "Stand Your Ground" laws, and just as universally seem to misinterpret them. In states which have passed them (Florida and Texas, to name a couple of the most high profile) these were simply a rescinding of a previous requirement to retreat before using deadly force in self-defense. The "retreat requirement," in the states that rescinded them as well as the states which still have them, all included the caveat that retreat was only demanded if it could be accomplished in complete safety to oneself and to others one had the right to protect. It is hard to imagine the proverbial "good guy with a gun" shooting anyone if he could have simply walked away with no danger to himself and other innocent persons. Thus, the Stand Your Ground law does not really change "the rules of engagement," it simply clarifies that when a person is where he has a right to be, and is not committing a crime or deliberately provoking an assault, he is not required to retreat before using force in self-defense against deadly danger. Things got murky when pundits misinterpreted the law, and confused one law with another. The legislative package passed in Florida that encompassed the Stand Your Ground principle included other reform legislation. The Stand Your Ground element, the rescinding of the retreat requirement, was found in Florida Statute 776.012. Statute 776.013 clarified and confirmed the long-standing Common Law principle that one’s home is one’s castle, and if attacked there, one need not retreat. More confusion came from two elements encompassed in one more statute in the package. Statute 776.032 is titled "Immunity from criminal prosecution and civil action for justifiable use or threatened use of force." It says that an individual claiming self-defense after having used deadly force shall be entitled to a hearing, which in essence is a mini-bench trial before a judge, and has the burden of showing to a preponderance of evidence standard that it was indeed self-defense. If he achieves this, the judge can, and should, throw the case out, ending the matter there insofar as the criminal courts are concerned. "Preponderance of evidence" means "more likely than not," in other words, a greater than 50% certainty. Some have taken great umbrage at that. They apparently don’t understand how the law in general works. To convict the shooter in criminal court, the prosecution would have to prove beyond a reasonable doubt that he was guilty. Judges don’t usually quantify it numerically, but law professors generally describe the "beyond a reasonable doubt" standard as a degree of certainty of guilt in the high 90th percentile. Let’s do the math. If, at the hearing, the defense convinces a judge that, more likely than not, he is not guilty, how on earth is the prosecutor ever going to convince a jury of a 95-99+% degree that he is guilty? This statute was designed to deter politically-motivated prosecutions. A wrongful prosecution is not only manifestly unjust, it is a terrible waste of tax dollars. It costs thousands of dollars a day to keep a courtroom open, and some trials last for weeks or even months. Defense attorneys don’t charge chickenfeed, either. It is not uncommon for defense lawyer fees to reach six figures by the end of a long and arduous trial, and some have gone into seven figures. You’ll hear people say, "That awful law keeps victims and their families from suing the shooter to get justice, if the shooter just claims self-defense." Au contraire. What 776.032 actually says is, "A person who uses or threatens to use force as permitted in s. 776.012, s. 776.013, or s. 776.031 is justified in such conduct and is immune from criminal prosecution and civil action for the use or threatened use of such force by the person, personal representative, or heirs of the person against whom the force was used or threatened …"
Please read that carefully. If the force was used "as permitted" and the individual "is justified in such conduct," it means that such has been determined already by the criminal justice system after investigation! The shooter not being charged is not enough, nor is even an acquittal after a homicide trial: those things only mean that the State couldn’t prove the shooter guilty beyond a reasonable doubt, and that is no protection against a suit in civil court, where the standard of proof is the much lower preponderance of evidence. No, the way it works in actual practice is, this means a court has already ruled that more likely than not that the shooter was justified, or the State’s Attorney’s office has issued an official Memorandum of Closure stating that the investigation showed the shooting to be justified. Thus, a civil trial would likely have been fruitless in any case, and once again a wrongfully-accused person who fired in self-defense is spared the enormous cost of trial, and the taxpayers are spared the enormous expense of a fruitless show trial. For the most part, the gun owners’ civil rights side is winning at the state level. Left: Here, Rich Pearson, president of Illinois State Rifle Association, discusses recent advances at IGOLD, Illinois Gun Owners’ Legislative Day, 2016. Middle: Alan Gura, the attorney who won “Second Amendment is an individual right” decisions from SCOTUS in landmark Heller v. DC and McDonald, et al v. Chicago cases. Right: Alan Gottlieb, head of the Second Amendment Foundation, which has financed many key court victories for gun owners’ civil rights. At this writing, it appears that the 2016 Presidential election will come down to Hillary Clinton and Donald Trump. Mrs. Clinton has made banning of high-capacity magazines and semi-automatic rifles a cornerstone of her campaign, while Mr. Trump has emphasized his support of the Second Amendment and the right of law-abiding armed citizens to carry concealed handguns to protect themselves and their loved ones. There has never been a more stark election choice on this issue. The next President will, in four years, be able to appoint at least one or far more than one new Justices to the Supreme Court of the United States. The Heller decision of 2008 and the McDonald decision of 2010 by SCOTUS are what clearly confirmed the right to keep and bear arms as an individual right for Americans. Each were 5-4 decisions among the nine members of the highest court, and Justice Antonin Scalia, who voted in line with the Constitution of the United States, is no longer with us. This, more than anything else, will make the 2016 election absolutely crucial to the next two generations of Americans who wish to maintain their Constitutional Rights, and it will be true for the House of Representatives and Senate elections as well as the Presidential race. Vote. Vote wisely. Your rights, and those of your descendants, are literally at stake.